The Doll by Boleslaw Prus is considered by many the greatest achievement of Polish literature in the 19th century. I previously read and posted on his shorter novel, The Outpost, set among country peasants in Czarist Poland being forced from their land by Germans. I also read his very good long short story "The Recurring Wave" centering on a factory owner, his spoiled son, and the factory workers. I would first suggest those new to Prus start with "The Recurring Wave" and then read The Outpost. A practical advantage of this is both of these works can be found online, for free. The Doll is a much grander work, encompassing much of Warsaw society in the period. It sort of centers, with lots of excursions, on the life of a shop worker who becomes rich and his progress up and down the social scale. He starts as waiter, comes into an inheritance and then makes huge money as a war profiteer in partnership with a Russian. Like most all novels of the sort and period, a great deal of time is devoted to the marriage lottery. He wants to enter upper class society through marriage to a baroness. There is a second narrative thread around a journal kept by an older store clerk, set back in time twenty years. We meet people of all social levels as we walk the streets of Warsaw. As I read the story I was struck by the many references to Jews in the narrative, by my count 249. Almost all portray Jews in a very negative way as grasping venal money grubbers taking advantage of the trusting Poles with sharp business practices, forcing people into poverty. In one disturbing scene that I still am not sure how to take a character says the centuries of prosecution of Jews has made them worse and worse as they do what they must to survive. The continual comments on Jews, from people of all parts of society, are presented without irony as if they are just commonplace truths. I do not know if we should see this as an anti-Semetic work or a portrayal of the pervasive hate for Jews in Late Czarist Poland or as an expose of ignorance and pernicious evil. Much of the hatred seems based on jealousy and envy. Of course for us now we read these references with the knowledge of the coming Holocaust and of the horrible pograms against Jews in Czarist Poland. 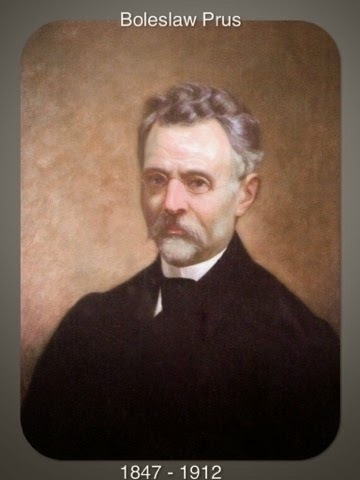 Bolesław Prus (1847–1912) was born Aleksander Głowacki in the provincial town of Hrubieszów, Poland. His mother died in 1850; his father, an estate steward of noble birth (the author’s pen name is a reference to the family’s origin near the Prussian border), died six years later, leaving him in the care of relatives in Puławy and Lublin. In 1862, he moved to Kielce with his older brother Leon, a Polish patriot. The next year, the teenaged Aleksander joined in the January 1863 uprising against Russian rule. Wounded in battle, he was imprisoned in Lublin Castle, but released when he was discovered to be underage. He then finished high school and enrolled in university, but lacked the funds to graduate. Instead, he worked several odd jobs, including a stint in a metallurgical factory, before taking up journalism. Prus eventually made a name for himself as a writer of feuilletons, publishing his much-admired Kroniki in the Kurier Warszawski between 1875 and 1887, and also achieved some success with his short stories. The Outpost, published in 1885, was the first of four novels that secured his literary reputation. It was followed by The Doll (1890), Emancipated Women (1894), and The Pharaoh(1897). A respected but no longer fashionable writer, Prus dedicated his last years to social reform and philanthropic work. From the NYRB webpage. I am very glad I read The Doll. It is structured in a very interesting fashion, there are lots of wonderful small vignettes, and well done characters. Before you buy it, read the two works I mentioned first.